Fishermen have a dilemma this time of year. Its hard to decide whether to go fishing for crappie or bass. Both bite good during March and you can usually catch a good many of either species. Its hard to decide which to try to catch. Last week I got to go with experts at catching both. They don’t have to decide, each of them concentrates on one species only all year. I met Mark Collins at Weiss for crappie fishing and Mike Morris for at West Point for bass. Each of them will be featured in articles in both Georgia and Alabama Outdoor News April issues. Mark Collins has been guiding full time for Lake Weiss crappie for 23 years. He knows how to catch crappie there year round and spring is one of his best times for catching large numbers of fish as well as big fish. This time of year he is trolling for them from his center console boat that will hold up to four fishermen and he runs three rods per fisherman, including himself, the legal limit on Weiss. Driving into the area around Lake Weiss you will see signs proclaiming Weiss is the “Crappie Fishing Capital of the World.” It has long been known for producing a lot of very big crappie. The lake has perfect habitat for crappie and local businesses, Alabama Power and the state of Alabama all work to keep it good and make it better. Statewide in Alabama there is a nine inch size limit on crappie to protect the smaller fish and let them grow. On two lakes, Weiss and Logan Martin, the next lake downstream on the Coosa River, both have ten inch limits to help produce quality fish. Mark is a board member of the Weiss Lake Improvement Association, an organization that works to improve habitat for crappie and other fish on the lake and promotes fishing there. One of the things they have done is put out brush piles made of cane. The GPS co-ordinates for them can be found on his website: http://www.markcollinsguideservice.com/habitat-sites-locations.html. Not only do those brush piles give fishermen a good place to fish, they offer crappie and other species a place to live, feed and grow. Mark scared me but impressed me at the same time. I was to meet him at noon Monday and ride along that afternoon with him and a guide client. About the time I go to Carrollton he called and said there was no reason to come, the fish were not biting and he had canceled his guide trips. His website says “No fish, no pay,” one of the few guides that will do that. But he says he wants happy clients that will come back for repeat business so he will call them if the fish aren’t biting. Fortunately for me, he was out fishing trying to figure out what to do to catch fish. I met him at Little River Landing and Resort, the only full service marina on the lake. They even have rooms to rent and a small restaurant. He had caught about eight crappie that morning, a couple of them over two pounds, so we had fish for pictures for the article. Eight crappie over ten inches long sounds like a decent catch to me but Mark expects to have 30 fish per person limits each day for his clients. If you want to go out with one of the best guides on the lake you can contact him through his website or call him at 256-779-3387. This entry was posted in Crappie Fishing on March 11, 2016 by ronniegarrison. Walter F. George has long been known for its excellent crappie fishing. In September night fishing is very good for them. Tie up under any of the bridges on the lower lake like the one in White Oak Creek, hang a light over the side and fill up your cooler while crappie fishing at Lake Walter F. George in September. Areas of standing timber are also good, like the mouth of Bustahatchee Creek. Anchor near the old creek channel over the timber and put your light over the side. It is a little more difficult to position your boat than it is under a bridge and you need two anchors to hold your boat steady. 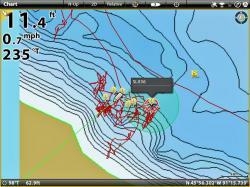 With a depthfinder you can usually see the fish and know what depth to fish. Without one, drop a minnow or Hal Fly jig down to nine feet and work it at that depth for a few minutes, then drop down another foot. Keep slowly changing depth until you start catching them. Light line is the key. Four pound test fluorocarbon is best but you may have to go to six pound to land bigger fish, especially in the timber. Try different color jigs and different size minnows until the fish pick their favorite and then offer it to them. This entry was posted in Crappie Fishing, Where To Fish on November 12, 2015 by ronniegarrison. What Is Dropshotting for Crappie? Drop shot rigging is a staple presentation of serious bass fans from coast to coast. But it remains a largely overlooked option for anglers pursuing other species of gamefish, including crappies. That’s unfortunate, because in the right situations, drop shotting can yield banner catches, and even outfish textbook strategies. “Drop shotting is a great choice whenever the fish are relatively close to bottom and you want to cover water a little faster, or with more precision, than you can with slip bobbers or vertical jigging,” says veteran fishing guide and lifelong panfish fanatic Scott Glorvigen. 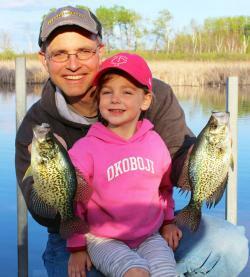 Case in point: the late summer to early fall crappie migration. “When crappies abandon withering shoreline weedbeds and head toward the main basin where they’ll spend the winter, they often follow bars and points that serve as travel corridors on their way out to deeper water,” he explains. Drop shot rigs excel at presenting a tantalizing softbait or minnow at or just above the level of fish, and allow anglers to customize the speed of retrieve and amount of animation, without fear of the rig falling to bottom or drifting out of the strike zone. Glorvigen admits his fall panfish epiphany came while chasing bass on a north-central Minnesota lake. Glorvigen credits the ultra-sensitive readings from his Lowrance Elite 9 CHIRP electronics for revealing the difference between bass and panfish. “I was also catching the occasional crappie here and there, which told me that drop shotting might be a winning presentation in this scenario,” he adds. To tempt more crappies into biting, he traded the bass-sized worm for a more panfish-appropriate, 3-inch Impulse Angleworm from Northland Fishing Tackle. Panfish-sized softbaits excel on drop shot rigs. He also down-sized the business end of the setup to a size 4 VMC Spinshot Drop-Shot Hook. “The Spinshot hook is great for drop shotting because it spins around, allowing the bait to move freely, without causing line twist,” he says. After threading on the worm so the tail remained free for maximum gyrations, he added a live crappie minnow for extra attraction. Glorvigen’s rigging also included a 7-foot, medium-light Lew’s spinning outfit spooled with 10-pound-test Northland Bionic Braid mainline and an 8-pound-test monofilament leader tethered to the hook’s lower line tie. “The setup works great for crappies, and can still handle the occasional big bass that grabs the bait,” he says. Glorvigen compulsively keeps sinker weight as light as possible when drop shotting panfish, and this was no exception. “It’s important to use the lightest weight you can get away with, so you can feel the fish but they can’t feel the sinker,” he explains. Glorvigen says pencil-style weights ranging from 1/8- to 3/16-ounce were perfect in the 11- to 19-foot depths he was working. Once rigged up, he’d cast out, let the sinker settle, and then tighten the line for a direct connection that allowed him to detect bottom as well as subtle bites. “You can move the rig across by reeling, drifting or using your trolling motor to slowly cover key areas,” he notes. No matter which means of propulsion you choose, Glorvigen recommends toning down the amount of action you give the bait. 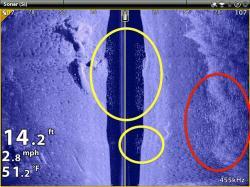 High-quality sonar and GPS can help you find and catch fall crappies. Glorvigen notes that a good GPS chartplotter is a big help in mapping out structural thoroughfares and waypointing key areas that hold the most fish. “Custom mapping systems like Lowrance’s Insight Genesis, which allow you to map structure in fine detail, can really help you get the lay of the land and learn why the crappies are attracted to certain areas over others,” he adds. While the fall crappie transition is a great time to throw drop shot rigs, Glorvigen says there are plenty of other times it pays to keep an open mind on the water. Check out this video for more of Scott’s drop shot tricks. This entry was posted in Crappie Fishing, How To Fish on October 12, 2015 by ronniegarrison. How Can I Catch Crappie On Lake Lanier? Lake Lanier is a 38,000 acre Corps of Engineers lake just north east of Atlanta. Since Atlanta draws much of its water supply from the lake, it has been in the news a lot the past year because of low water levels. It is also one of the most popular recreation lakes in the US. 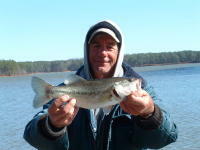 Mention fishing at Lake Lanier and people immediately think of spotted bass and stripers. But the lake has an excellent population of crappie and a few fishermen have learned how to catch them. You can often catch 100 crappie a day at Lanier this spring and 200 fish days are possible. Todd Goade lives in Buford and loves all kinds of fishing. Last year he finished third in the point standings on the Bulldog BFL Trail. He enjoys tournament fishing and when he is not fishing the BFL or another bass fishing trail he often will be catching crappie at Lanier. Last spring he teamed up with Alan Gee to place second in the Crappie, USA tournament on Lanier. Todd and Alan fished the pro division and weighed in a seven crappie limit that weighed 9.83 pounds. Although they caught over 200 crappie that day, they did not catch the big fish that would have increased their weight. Catching and culling through 200 crappie is a fun way to spend a day on the lake. There are several reasons Todd likes crappie fishing at Lanier. It is more relaxing than bass fishing so it is a nice change-up. The tackle is simple and easy to use. Crappie are excellent table fare and are hard to beat no matter how you cook them. And you can catch a lot of fish. Who wouldn’t like feeling a fish at the end of your line every few minutes. Todd says there are a lot of pound to pound and a half crappie in Lanier but two pounders are hard to find. The Crappie, USA tournament results from last March bear this out. There were only five crappie brought to the scales weighing over two pounds and big fish for the day was a 2.31 pound fish. But who can complain about catching crappie that weigh over a pound each? And that is scale weight, not “guesstimate” weight. Todd has learned how to catch Lanier’s crappie and the way he does it will work for you. Shooting docks with jigs is the way he likes to catch them. You will need a boat, light spinning rod and reel loaded with 4# test line and a couple of cards of Hal Flies. “In April it seems like every crappie in Lanier is under a dock,” Todd said. Since there are so many docks on the lake and so many crappie under them, targeting docks is definitely the way to go. And you can catch crappie under docks all year, not just in the spring. Little River and Wahoo Creek are the areas Todd usually fishes, especially early in the spring. It is good year round but the water warms first further up the lake and those areas turn on first. Later in the spring the docks down the lake will be better as the water warms there. There is a little more color in the water further up and that causes it to warm faster. Water with a little stain in it is good. Todd likes to be able to see his jig down a foot or two but no more. Stained water warms seems to make the fish hit a little better since they don’t get as good a look at the jig. You can catch fish from extremely clear water but a little stain will help you catch more. Muddy water is tougher, too, so try to find stained water. Any dock on Lanier can hold crappie. Todd says you should start fishing an area and keep records and notes of where you catch good fish. He will often hit a bunch of docks in the morning then return to the ones where he caught fish later in the day. 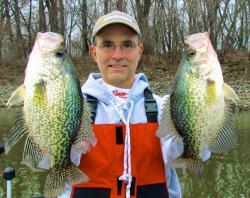 Early in March the crappie are likely to be holding on deeper docks toward bigger water. Docks with at least 17 feet of water under them are best. As the spawning urge takes hold when the water starts to warm the crappie will move back into the docks in coves and pockets and will be under docks with as little as six or seven feet of water. “The dogwoods bloom and the crappie spawn is the old saying,” Todd told me. When the water temperature is 62 to 64 degrees I expect most of the crappie to be back in pockets in shallow water spawning. But not all spawn at the same time. They move back in waves so you can find some fish in different depths most of the time. By late April after spawning the fish will move back out, holding on the same docks they used as they moved in. And some docks will be “honey holes” and hold crappie better than others. Sometimes you can pick these docks out by looking at them but you usually have to fish to find them. Covered docks are best and the more stuff overhead the better, according to Todd. Pontoon boats are especially good. Older docks seem to be better. A boathouse with a pontoon or boat lift under it can be excellent. Brush piles under and around the docks sweeten them, too. Todd seldom fishes an open slip in a boat dock. Crappie want something over there heads and an empty slip is way too bright. If there is a brush pile under the slip it might be worth hitting but usually he just goes to the next slip where a boat or lift offers lots of cover over the fish. Seeing green algae growing on boats, dock floats, posts and boat lifts means the dock is likely to be better. Baitfish feed on the algae and are attracted to docks with it. Crappie eat the baitfish so they are more likely to be under docks where there is a lot of food for them. To shoot a jig under a dock you need a five to five and a half foot spinning rod with a light tip. 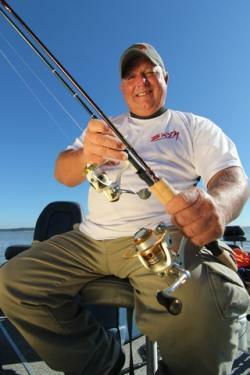 Todd likes an All American 5.5 foot rod and teams it with a small Pflueger President reel. The reel needs a smooth drag and the small spool helps the line come off faster. The line is very important and Todd chooses 4# test Trilene Fluorocarbon Professional Grade. This line is tough for its size, invisible in the water and works well on his spinning reel. A limp line is necessary for small reels and thin line helps the light jigs sink better. Todd uses Hal Flies for all his crappie fishing. He likes the 1/24 ounce jig best and he starts with a white or white and chartreuse jig. One with some pink in it is good in clear water, too. Many colors work well and some jigs with reds and yellows attract bites, especially if there is a little color to the water. Hal Flies have feather tails and Todd bites off a little of the end of them, making them just a bit shorter. He says he is not positive this helps him get more hits but he does it anyway. It is worth trying, especially if the fishing is tough. You never know what might help. Quietly approach a dock you want to shoot and get in close. Your boat will usually be just a few feet from your target. Kneeling or even sitting on the boat deck helps you get on the right level to shoot under the dock. A quiet trolling motor is best and Todd often uses his hand to move the foot control to position the boat. If you are in the back of the boat you can often just sit on the deck and stay in the right position for shooting the dock. Boat position can be critical. Sometimes fish seem to want the lure moving in a certain direction, especially if they are holding on a brush pile right in front of the dock. Experiment with different angles and let the fish tell you what they want. The bigger crappie usually hold in the hardest area of the dock to get your jig into. A narrow opening between dock floats and a boat lift float or pontoon float may mean you have to hit a six inch wide, four inch high hole, and you need your jig to go as far back as possible. Remember, the more stuff overhead the more likely the crappie are to be there, and the further back and darker the spot the more likely bigger crappie are to be holding. Open the bail on your reel and drop your jig down to the last guide above the reel. Grab the head of the jig between thumb and trigger finger with your free hand. While holding the line at the reel with your finger, pull the tip of the rod down to make it bow. Aim the rod at the opening you want to hit and release the jig. As it flies toward the target, release the line at the reel. It takes some practice to do this but is easier than it sounds. You will go high and hit the dock or go low and hit the water too soon but a little practice will have you putting your jig in spots impossible to reach any other way. Sometimes your jig will skip on the water and you can get it even further back, especially if there is not much clearance between the water and the top of the gap you are shooting. When your jig hit’s the water flip your bail shut and count the jig down. A 1/24 ounce jig on 4# line will sink about a foot a second. Todd says he counts “One Mississippi, Two Mississippi” to keep a consistent space on his count. You need to know the depth your jig is at when you start getting bites. Start by counting down to six and then slowly reel your jig back. No action is needed on the retrieve. Actually, jiggling your rod tip may hurt the chances of a bite. If you have ever watched a small minnow swim along it does not move much, it just glides along. That is what you want your jig to do. Try a few shots with a six count then try eight, ten and even 12 counts. Watch your line carefully at all times. If it jumps as the jig sinks, set the hook and reel in the fish. Just remember where it was on the strike and start using that count. Crappie usually hold at about the same depth on most docks. When Todd fishes with a partner they try different counts with one reeling in at six and the other at ten then both changing. That way they can cover different depths quickly. They will also try different colors. Once the fish tell them what depth they are holding and which color they like best both will concentrate on those keys. Another trick Todd uses is to let his jig fall an few inches just when it passes the end of the float or edge of the boat he is fishing. Sometimes a crappie will follow the jig and that little drop will trigger a hit. As you reel in watch your line, too. If it jumps or if you just feel it get heavy, set the hook. Don’t use a break-their-jaw hook set, just sweep the rod tip and the light wire hook in the jig will go into the soft mouth of the crappie. Play the fish slowly and carefully to the boat. Crappie aren’t called “paper mouth” for nothing. It is easy to pull a hook out of a big fish, even with four pound line. And you don’t want to break the light line. Often you will shoot over a bar or part of the dock under water. When you hook a crappie with your line over something, go to it with the boat and get it. You can not pull a decent fish over anything with such light line. Some people worry about getting a hook in their finger while shooting a dock. Todd says that has never happened to him. Holding the jig by the head turns the hook up and away from your fingers so it will not hook you when you release it. And it won’t come flying back at you if you try to pull it loose if it gets hung. Four pound line will almost always break before that happens. Todd will shoot his jig into openings on a small dock seven or eight times then move on. He tries a few shots at different depths but says crappie usually hit pretty quickly if they are there. There is no need to waste a lot of time if you are not getting bit. But if you do catch one fish you are likely to catch several. Don’t hesitate to go back to docks where you caught fish earlier. Crappie will often move in and out around the dock and will be easier to catch at different times. And Todd says watch your depth finder. You will often see a school of crappie near a dock, or brush out from it. When you spot either back off and work your jig through that area at different depths. Schools of crappie often look like balls of baitfish on your depth finder they are so close together. Baitfish may be present, too, and that is a good sign. Always keep an eye on what is under the front of your boat. Bass boats are fine for shooting docks but their high decks are a drawback. A lower, smaller boat allows you to get down to the water level easier and make better shots under docks. If you are in a small boat just put in near where you want to fish since Lanier can get so rough. If you want to try your luck in a crappie tournament, Crappie USA has a tournament on Lanier on March 15, 2008 and West Point on March 29, 2008. There is also a tournament on Weiss on March 8, 2008 and Hartwell on April 5, 2008. You can enter the Amateur Division for a $75 per team fee or choose the Semi-Pro Division at a higher cost. Cash prizes are paid in each division but are higher in the Semi-Pro side. Crappie, USA was formed in 1996 and purchased the “Crappiethon” tournament trail. They hold 45 tournaments in 20 states each year. Each region has at least six spring and two fall tournaments. The Georgia tournament last fall was on Oconee. This entry was posted in Crappie Fishing, How To Fish on June 15, 2015 by ronniegarrison. How Can I Catch More Crappie This Spring? You can see an example of this Spot Lock/reposition cycle in this screen capture from my ONIX system, as I adjust my boat’s position along the weed edge. Remember, the fish are here to feed, and much like a herd of cattle, they will graze in one area until the food source is exhausted. Then, they will be on the move again – it’s your job to stay with them. This entry was posted in Crappie Fishing on April 14, 2015 by ronniegarrison. What Is Casting for Crappie? When it comes to catching crappie, spider rigging is popular along with long lining. However, just casting for crappie is the number one tactic for many crappie anglers. As with all fishing, catching crappie by casting requires that you put yourself where the fish are, whether you’re in a $40,000 boat or walking the bank. For crappie anglers in most areas, the best time to cast for crappie is in the springtime when the fish are up shallow spawning. Crappie will get up on the bank searching for spawning areas and make nests around cover or structure. Making target specific casts to cover and structure is the best way to catch these crappie. “Casting is a great way to get the bait or lure in front of the fish without spooking them when they’re up shallow,” says B’nM’ crappie pro staffer Brad Taylor. 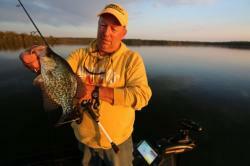 It’s not just Brad Taylor using a spinning rod and reel when casting for crappie. 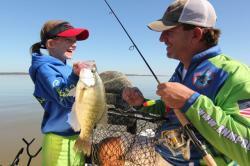 His daughter, Allie Bre, one of his favorite fishing partners, also loves to cast and catch crappie. “It’s a great time to take out your children and let them cast a live minnow or lure by themselves without having to help them and they can honestly catch a fish by themselves,” said Taylor. One of Taylor’s favorite crappie fishing spots is the renowned Grenada Lake in Mississippi. 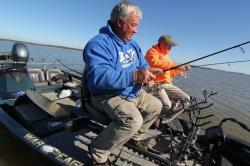 “Early in the year, I like to fish the grass on Grenada Lake since there is no structure to speak of here. I usually fish with a live minnow or Southern Pro Lit’l Hustler 1 ½-inch tube rigged on a 1/32- or 1/16-ounce jig head,” said Taylor. For live minnows, Taylor uses a #2 Eagle Claw 214EL light wire hook and #4 split shot. “Since the water is muddy on Grenada Lake, I can rig up with 8 pound test line when fishing with live minnows or even tubes,” said Taylor. Taylor likes to rig with a cork and keep the tube lure just above where the crappie are located. “Most the time on Grenada, I’m in about three feet of water catching them,” said Taylor. Casting light offerings can be challenging for the novice angler. However, a spinning reel can help eliminate some of the problems associated with casting especially live minnows or lightweight lures. Spinning reels have a fixed spool that doesn’t rotate. Instead the fishing line flows off the spool by being pulled from the weight of the lure. One reel especially effective for this duty is the WaveSpin spinning reel (www.wavespinreel.com) with a unique star-shaped spool lip that the company says is much less likely to cause tangles than conventional designs. Reportedly the design can also increase casting distances due to reduced line drag. The revolutionary spool features a row of teeth all slanted in one direction with gaps between the teeth reducing friction at the same time eliminating tangles. The reels have aluminum spools, all metal gears, over-sized line roller, infinite anti-reverse and an exclusive 10 disc drag system. Two anglers that don’t have any problems casting spinning rods and reels are B’n’M’s pro staff manager Kent Driscoll and B’n’M’ pro staffer/Grenada Lake fishing guide John Harrison (www.crappie101.com) who fish together in crappie tournaments. Both like to cast spinning rods and reels especially to stake beds. Stake beds are man-made structure commonly constructed from wood or PVC pipe to attract crappie. “When fishing stake beds, we approach them going into the wind because we can control the boat better and that lets us keep our distanced from the stake bed,” said Harrison. “We use live minnows, live minnows rigged on a jig with a soft plastic body or a 1/16-ounce jig. Normally, we will just cast past the stake bed and twitch it, pause, twitch, pause retrieve back through the stake bed,” said Driscoll. When it comes to crappie rods Taylor, Driscoll, and Harrison like using the B’n’M’ Poles Sam’s Super-Sensitive 7-Foot Crappie Rod (www.bnmpoles.com) or Buck’s Graphite Crappie Spinning rod. Both are lightweight graphite rods design just for casting live minnows or casting lures. Spinning reels and rods make casting live minnows and lures so easy any angler can do it. Then it’s a matter of cleaning the fish and heating up the cooking oil. This entry was posted in Crappie Fishing, How To on November 15, 2014 by ronniegarrison.